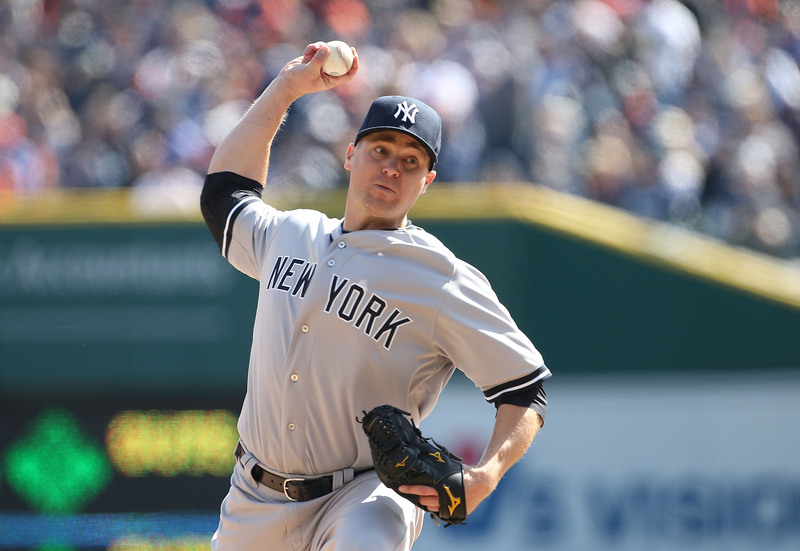 Shawn Kelley pitching for the Yankees last season. Shawn Kelley‘s two earned runs in the ninth inning came after Masahiro Tanaka’s seven strong innings in his first start at Yankee Stadium. The Yankees lost 5-4 as result of going 1-6 with runners in scoring position and grounding into two double plays. The Yankees continued their pattern of not hitting well with runners in scoring position to begin the season. With the offense that the Yankees have, even though Mark Teixeira is injured, they should be able to win games when the starter allows three runs. However, Brian McCann and Jacoby Ellsbury both went 0-4, McCann grounded into a double play and Yangervis Solarte’s double play ended the game. In the second inning, Carlos Beltran hit his first homer as a Yankee, and after Miguel Gonzalez retired McCann and Alfonso Soriano, Kelly Johnson hit his second homer as a Yankee, to make the score 3-2. The Yankees scored a run in the fourth, but based on Beltran hitting a double to right to leadoff the inning, they should have scored at least two. There were no hits after the double, and Beltran scored as a result of a groundout to the shortstop by Soriano. Once again, in the eighth inning, Brett Gardner hit a double to leadoff the inning, but the Yankees were unable get a hit to drive him home. After Gardner was sacrificed to third by Derek Jeter, McCann and Ellsbury both were not able to get a clutch hit. Tanaka gave the Yankees all they could have asked for in his pressure-filled first start at home. After allowing a three-run homer to Jonathan Schoop in the second, Tanaka only allowed three hits in the next five innings. In seven innings pitched, the 25-year-old had an impressive 10 strikeouts, seven hits and only one walk. It is a positive sign that Tanaka was able to rebound from a rocky beginning of the game in front of the home fans just like he did in Toronto. Kelley, who is the closer with David Robertson on the 15-day disabled list, allowed two runs and four hits in the ninth. He came in with the score tied at three, but in the non-save situation, Chris Davis’s sacrifice fly that scored Schoop ended up being the game winner. The Yankees scored a run in the ninth off of a sac fly, but they had a chance to tie or win the game, but Solarte, who has been a revelation so far, could not come through with a clutch hit when the team needed one. It would make sense to have Matt Thornton pitch in the ninth inning with Robertson out because Thornton has experience closing games. He had a combined 23 saves in his tenure with the Chicago White Sox, and Kelley has rarely pitched in the eighth or ninth inning previously in his career.